Distinctive features: The first of a long line of Casio hand-held scientific calculators. 8-digits, green vacuum fluorescent display. 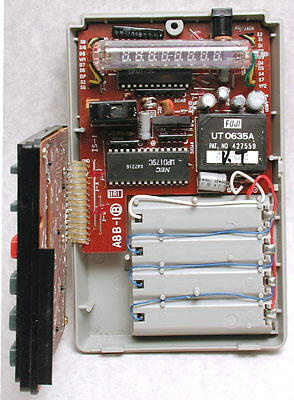 The display of the calculator above shows 12345670. The right-most digit is not a faulty 8 but a half-height 0, which was fashionable around this time. 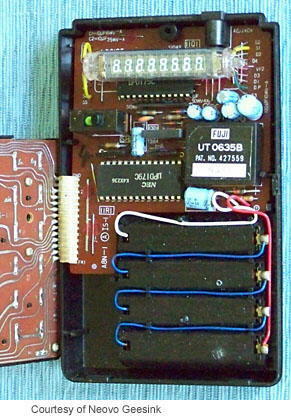 Main integrated circuit: NEC uPD179C, here date coded 1974. 95 x 150 x 32 mm. (3.75" x 5.9" x 1.3"). Price in U.S.A. in August 1974 was US$99.95. 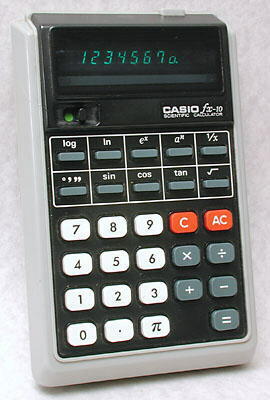 This was the first Casio scientific calculator. The name is derived from the calculator having 10 scientific functions, where "fx" is the scientific designation for function. By comparing these photographs of the Sperry Remington SSR-8, generously provided by Neovo Geesink, with the Casio fx-10 at the top of the page you can see that they are identical apart from the colour and branding. 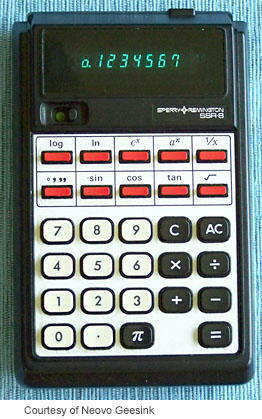 Casio manufactured several other models for Sperry Remington in the mid-1970s. "10-in-1 calculator", Popular Science, August 1974, p81.